This morning was the calm before the storm. Students had plenty of time to register their art projects and to sign up for other competitions before the 1st General Assembly at 1 pm. I got some coffee, got my internet access working, had a nice lunch with DJ Cavoli, 1 of the teachers at St. Edward. There is a General Assembly every day. All 1,700+ students and adults are in attendance. Each state has its own place. This year, Ohio is in the back left in the bleachers. The view from the OH delegation. NJCL President Danny Trunzo (Wisconsin) welcomed everyone to the convention. He stresed the importance of creating new ‘reLATINships’ with others from across the country. 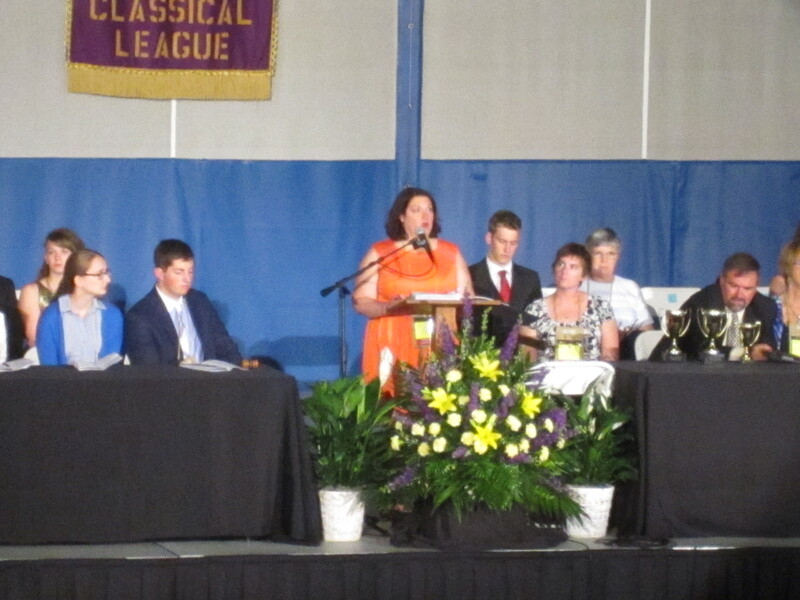 The Senior Classical League consists of college students who return to help run the convention. The SCL claims to be ‘omniscient, omnipotent, omnipresent, and indispensable.’ Most of them entered the 1st GA about 20 minutes late. (So much for omnipresent… but 3 out of 4 ain’t bad.) NSCL President Bri Forney (formerly Lakota West, presently Ohio State) informed the audience that the Senior Classical League was now the Senior Cupcake League. Sounds yummy! 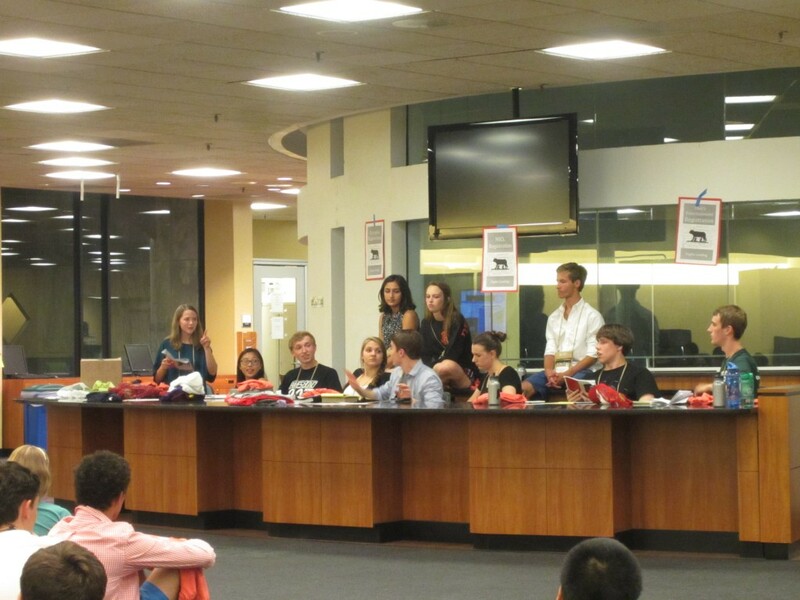 2014 NSCL President Bri Forney delivers her controversial ‘cupcake’ decree. Ohio has a number of former NSCL officers: Melissa Burgess (Indian Hill), Brian Compton (Moeller), Steve Gentle (formerly of Indian Hill and Miami University), Sherwin Little (Mr. Latin himself! ), and Christopher Warrington (formerly of Seven Hills and Rice). NJCL stands for National Junior Classical League. This is the 61st convention (the 1st was in 1954). There are 46,539 members in 1,107 schools in 45 states & 1 Canadian province. 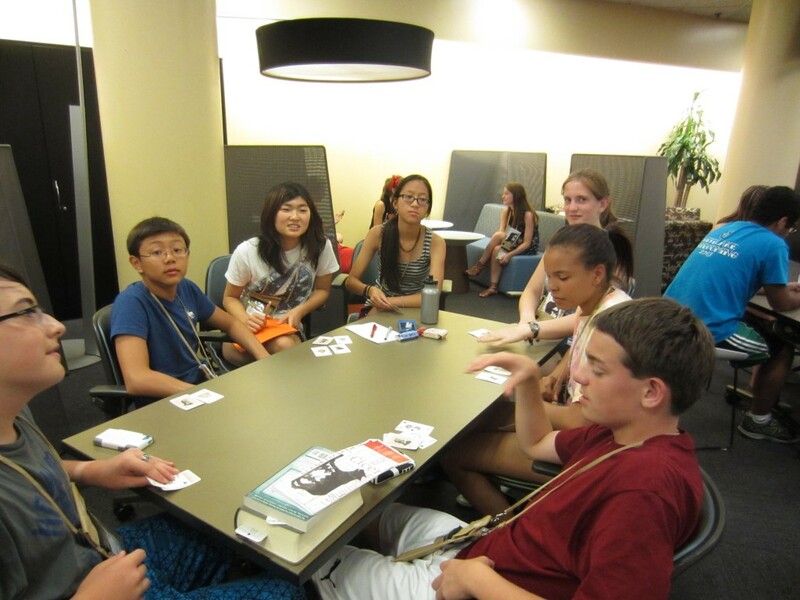 There are 10 schools with over 200 NJCL members; the largest is Boston Latin School with 320 students. Ohio has 7 ‘century’ schools with over 100 members: Madeira (128), Indian Hill (116), Summit (114), Wyoming (107), Lakota West (103), and Lakota East (100). 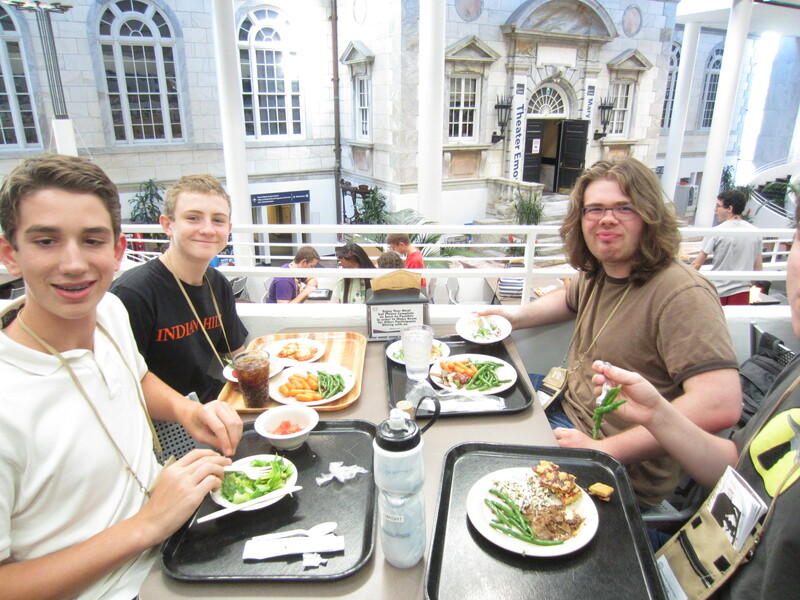 Lunch at the dining hall. GA 1 was followed by the traditional teachers’ meeting to emphasize students safety and to confirm the judges for the various competitions during the week. All the adults are very busy all week to make the convention a positive experience for the kids. 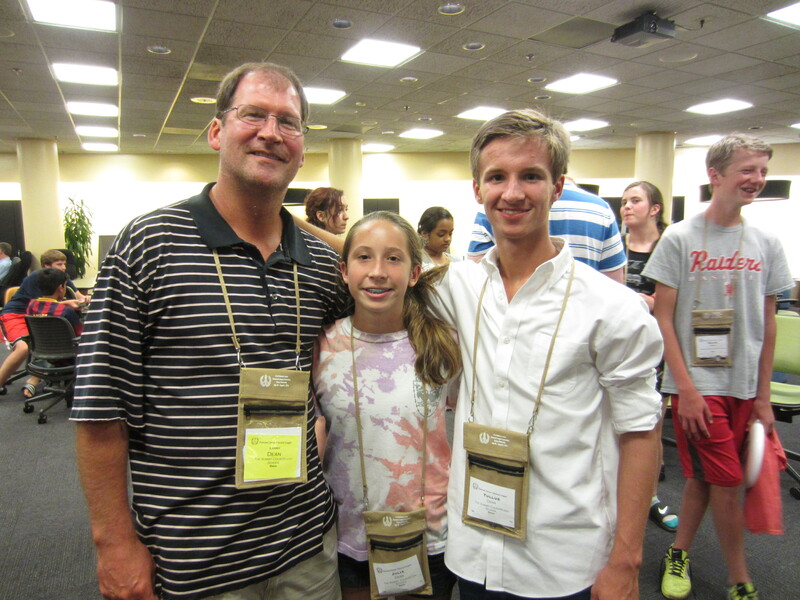 I had my 1st convention duty after dinner at 6:15 pm: Latin Oratory. Martha Altieri (CA), David Neal (GA), Laurie Covington (VA), and I judged the advanced Latin students, all of whom were either recent graduates or rising seniors. 19 students had memorized the same short speech (about 2 minutes) by a Gallic leader who was urging his people to fight against Caesar and the Romans. We judged the students on their performance: memorization, pronunciation, eye contact, phrasing, the whole ‘bringing the story to life’ thing. We gave a few of the speeches close to a perfect score. Some of them clearly had some theater experience. Julia also did the Latin Oratory for Level 1 but was not overly pleased with her performance. 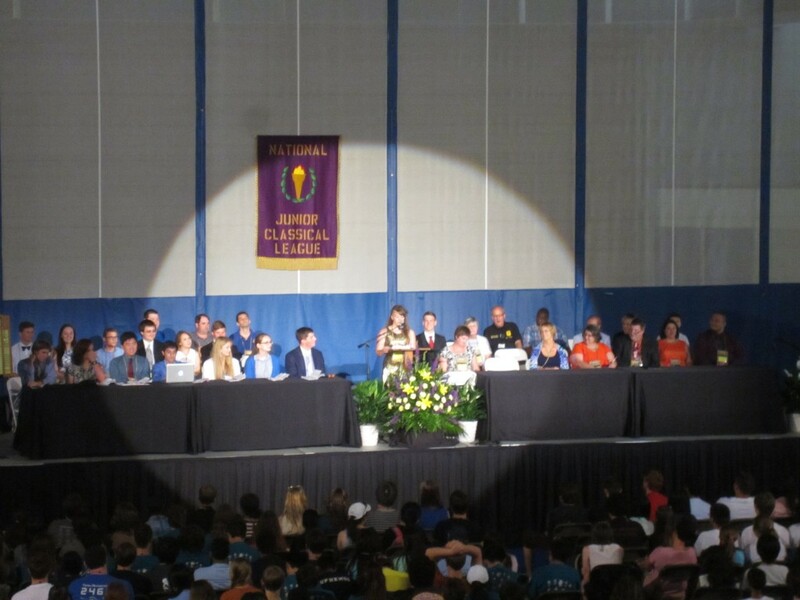 At 9 pm, it was Certamen Orientation for the players & coaches (more on that when the competition begins tomorrow). 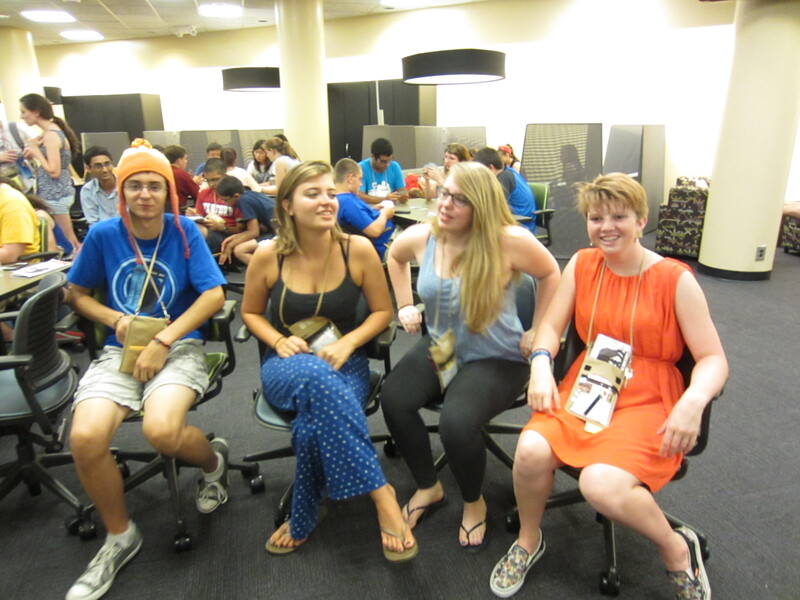 Then, at 10 pm, it was the Orientation for the World Series of Certamen (more on that and the Bad Larrys later in the week). The OH Executive Board: Hannah Barrett (Shaker), Allison Kao (Shaker), Dustin Argo (Summit), Lindsey Dierig (Turpin), Sara Zandvakili (Indian Hill), Katarina Packis (Westlake), Tullus Dean (Summit), Tim Goldenberg (Granville), and Will Beatrez (St. Edward). Lastly, there was the nightly fellowship, 10:45-12:00. All 135 OH people meet together to discuss the day’s events and prepare for tomorrow. Click here for a link to a video of the OH delegation before the nightly fellowship on Mon. A student ate a half-baked brownie at dinner – but was thrilled b/c batter + caramel = delicious. A number of students did not like the pizza. ‘It tasted like cardboard’ became ‘No! It was worse than cardboard.’ My advice for the rest of the week: eat something else, b/c there are many different choices. Something to look forward to: video of the dining hall tomorrow. Treasurer Lindsey Dierig is in charge of selling OJCL stuff at the bazaar and had a great 1st day: $226! Then the Lakota West group noted that they made over $400. 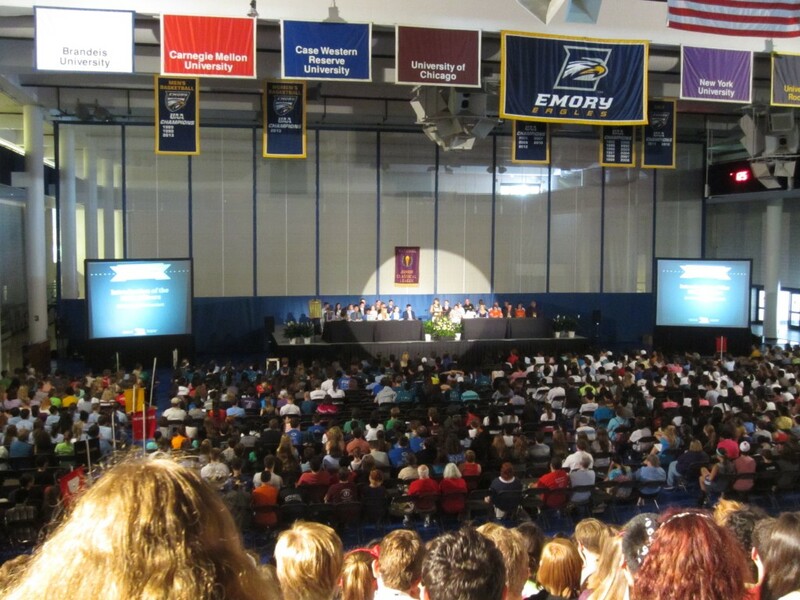 The students practiced their cheers for tomorrow’s spirit prior to GA 2. 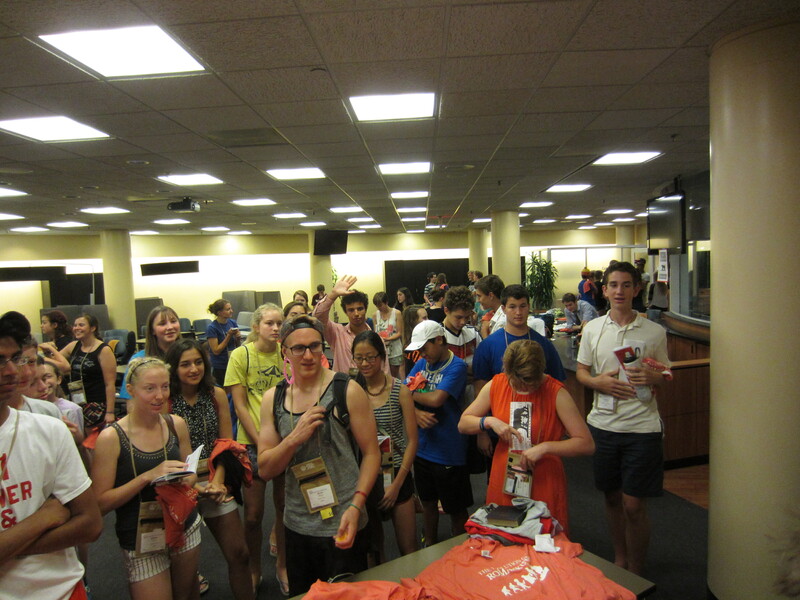 Students gather to sign up for the Ludi events: volleyball, ultimate frisbee, soccer, and basketball. Melissa Burgess is the NJCL Graphic Arts Chair. Seated to the right is the most powerful woman at convention, Chair of the NJCL Committee and of Creative Arts Amy Elifrits (Lakota East).